Abstract. The presentation starts by highlighting a number of subjects that traditionally, and still today, are the bulk of the research activities in oil industry, notably in the fields of geophysics  exploration  and flow through porous media  production. Specifically after brief problem descriptions in these areas, the  partial differential  equations associated with these problems are presented, as well as the applications resulting from solving these equations. Because the diversity of the different applications is emphasized, the character will be that of a 'guided tour', rather than getting specific. In the midst of the 1990's an important problem in production operations, namely the duration and evaluation of an oil well production test, was formulated and solved in terms of a mathematical stopping time problem without any recourse to a physical model. This marked the beginning of a New Development in parallel to the traditional ones, resulting in an application that monitors and controls the production of oil  and gas wells and that is being rolled out globally throughout the Shell group. This application is very much in the realm of the  topology of  dynamical systems, and takes in only information that is provided by the local technical infrastructures through measurements. An excerpt is presented of the discussions, still on-going today, that sparkled this New Development. What these applications thus far have in common is that sooner or later virtually all of them have to pass a Gate over which is written: 'Numerical Linear Algebra'. To put it bluntly, we could say that regardless of their origin, most of the challenges we are facing have to fit 'at the end of the day' into the structure of vector spaces from linear algebra, with real  or complex numbers operating as scalars upon them. The thought that for some problem the Gate may be too narrow seems inescapable. From a purely mathematical point of view widening the Gate is the logical step from generalizing the vector spaces to modules. Spectacular developments in Algebra, specifically in Computational Commutative Algebra that are taking place roughly since the 1990's, have made it possible to also realize this generalization, and hence giving rise to a 'second generation' of the New Developments in exploration  and production research. 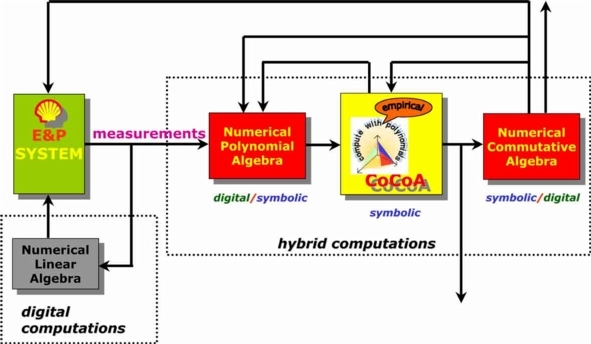 The University of Genoa is, together with the University of Dortmund in Germany, a key player in this new mathematical development in this research area, specifically through their development of the computer algebra system CoCoA. It will be made clear that in this new development an 'oil  and gas system' is no longer an anonymous object that generated the data, thereby expunging the larger part of the criticism from the 'physical modellers' on this approach. Also the new challenges we are facing around algebraic problems with empirical data are discussed briefly. The presentation ends with a short exposition of the CoCOil project, the by Shell sponsored cooperation with the universities of Genoa and Dortmund, in which in a four years research program an impressive number of problems are addressed in this new context, including major problems like increasing the ultimate recovery, that is producing a larger portion of the known reserves. Organizzato da: L.Robbiano, D.Arezzo, C.Bartocci, M.Cavaliere, A.Conca, L.Pusillo.